A petition signed by over 96,000 people and an Open Letter signed by 92 environmental groups have been handed over to Greg Clark, Secretary of State at te Department for Business, Energy and Industrial Strategy. 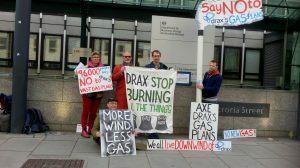 The petition and letter urge Greg Clark to refuse planning permission for Drax Plc’s plans for the UK’s largest ever gas power capacity to replace its coal units slated for closure by 2025, under the Government’s coal phaseout policy. Drax is already the U.K.’s single largest emitter of carbon dioxide, burning more wood than any other power station in the world, as well as continuing to burn coal. With the UK government planning a coal phase-out by 2025, Drax now wants to build the country’s largest ever gas power units and is asking for substantial new subsidies, in addition to the £2.16 million a day it already receives for burning wood. Please click here for the press release and here for a briefing about Drax’s gas power plans.